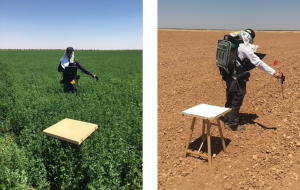 In the midst of heatwave conditions, even for La Mancha in August, a small team from the National Physical Laboratory (NPL) returned to Barrax to conduct a second set of reflectance measurements. 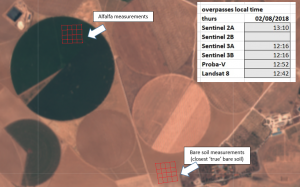 Our aim was straightforward: collect surface reflectance (specifically hemispherical-conical reflectance factor – HCRF) data to internationally recognised fiducial reference measurement (FRM) standards, coincide with the satellite overpasses of Sentinel-2A, the twin Sentinel-3 pair orbiting in tandem, PROBA-V and Landsat 8 – all within a measurement window of 90 minutes. So the date was set for Thursday the 2nd August 2018. On Wednesday morning, the day before the overpass, we found ourselves in the familiar surroundings of the Barrax – Las Tiasas experimental farm, greeted by clear blue skies. We set to work assessing the current crop conditions and formulating plans for the next day. The plan was to take two sets of measurements within the overpass window – one over the low reflectance alfalfa field (from the pea family) and one from high reflectance bare soil. At the height of summer, most fields in the vicinity were not cultivated, except where the rotating hydration system was activated (hence the circular fields). The image below is the Sentinel 2 image on the day. Although it would appear at a glance that most of the area was in a ‘bare soil’ phase, in reality the closest fields to the green alfalfa area contained crop or other debris from previous farming cycles, so discounted as test sites. After some walking around two sites were selected, all we had to do was wait for the satellites! The location of our two measurement areas marked out in red (click to expand). Plots, of dimension 200 m by 200 m, were paced out using GPS, and measurement locations within these plots marked with flags. Every preparation was made to save time in the critical period of the following day – a schedule was scrupulously prepared to account for every precious minute of the multi-overpass window. As Thursday dawned, the team set out provisioned with copious water supplies. At each point, the spectroradiometer was normalised to the reference Spectralon panel (tuning the sensor configuration: integration time, etc.) with two panel reflectance measurements made either side of four reflectances measurements. With bare soil readings completed, we rapidly shifted operations to the alfalfa field and took a further set of measurements there, carrying the heavy calibration panel and other equipment through the dense field all the while watching out for the (well-concealed) irrigation channels that criss-crossed the field. At the time of the overpass it was easy to imagine the satellites zooming over ahead, though of course invisible to us in the bright skies. A couple of hours spent shunting all measurement and calibration equipment around the fields in 40 degree temperatures was sufficient to complete our practical work, in time for a late lunch of refreshing gazpacho soup at the local roadhouse cafe. Measurements were taken at the alfafa and bare soil sites by Niall Origo, using the portable Analytical Spectral Devices (ASD) FieldSpec 4 instrument. The Spectralon panel is shown in the foreground (left with cover on; right off). We are now in the process of analysing the results, and, furthermore, applying FRM techniques to these data. Thank you to Dr José González Piqueras and Alonso Garrido, of the Universidad de Castilla La Mancha (UCLM), for generously assisting with logistics and storage of equipment. Their department does a great deal of work on both Earth Observation and long-term in-situ monitoring at this field site – check out their website (in Spanish – click small flag for the English version). We’d also like to thank ‘super-sub’ Dr Paul Green, of NPL, for stepping up to the plate to very ably assist with transport and field assistant duties.